Is there one? Obviously the Builders have the hammer and cog, but I dont remember ever seeing something consistent. I want to put a sign outside a guildhall on an FM but I dont want to contradict an existing logo or symbol. I don't recall one being made before. Now is as good a time as any for an artistically inclined person to make one. Those gears lend themselves pretty well to the use in a logo. I thought I'd seen something like the stonemason's logo used somewhere, which would be fitting. The gear is already used by the Builders, so I wouldn't also use it for the IG. I saw this as well. I think Ill just go with a simple text sign with a gear. Thoughts on this quick concept sketch? Looks good! I could see that translating well to a cloth banner logo. I guess a wooden sign would need to be a bit simpler in design though. There are a lot of elements on it, the lightning bolt is a bit of a stretch, and the middle will instantly be recognized as a Freemason logo. Hard NO. We shouldn't use a real-world logo to an actual organization. A cross of tools and having a gear in it I think would work though to show they aren't completely separated from builder ideology but may see themselves as a kind of offshoot. I took part of the masonry logo because I thought it represented the invention aspect well. I wanted something that represents invention and not just construction. The lightning bolt was for the powered machines, I was going back amd forth between that and a screwdriver but it seemed anachronstic and left the logo with no reprentation of power generation. Im not sure about the drawbridge bc its a civil engineering thing and the inventors are more mechanical. Id love any constructive suggestions on what I could include that would fit thematically and aesthetically. Revision 1. Im on my balcony and dont have whiteout nearby and messed up the lightning bolt but the general idea is there. Removed the square and flipped the protractor to remove the masonic connotation. Changed the background to 2 tools and made the lightning bolt more central, plus putting it in the hand makes it clear that it represents harnessing power. Not bad. Even though that fist in the middle rather resembles some kind of socialist worker activist group. Its looking a lot better now, but Id change that middle icon to something else. Thought about the same thing, (electric) power to the people! This subcategory and this one could be particularly useful, I suppose. I think it also wouldn't hurt to look at a variety of historical coats of arms used by guilds in various countries of Europe, and other areas. 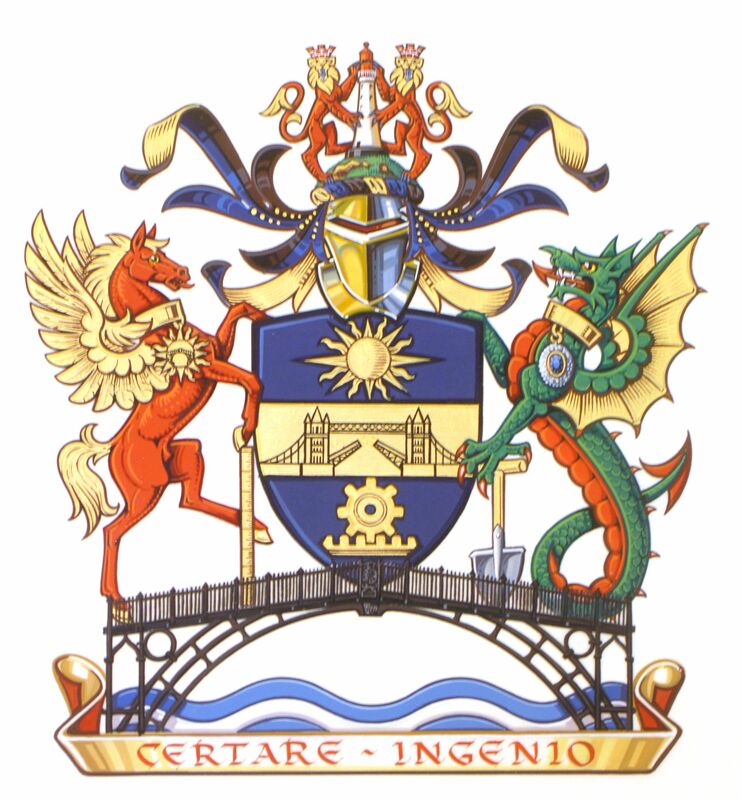 I've designed a fair few coats of arms and emblems over the years, and I'd be glad to add my two cents. It all depends on what people expect from the IG. 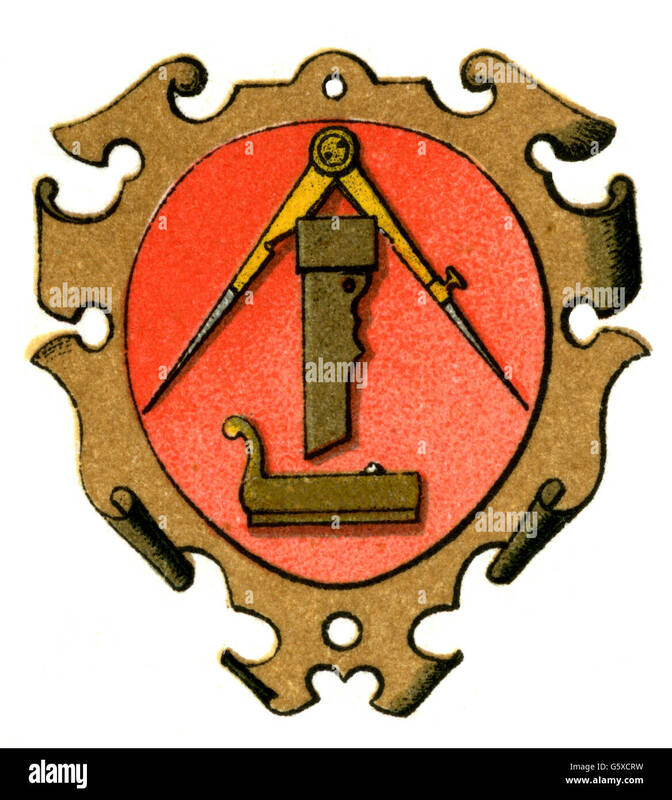 Should they be very upfront about the steampunk elements, or have more traditional, more basic craftsman imagery in their emblem, or some happy equilibrium of both ? I'm intrigued by the lightning bolt idea, but I wonder whether a hand holding it can be made to look convincing. here's a thought: Maybe instead of a naked hand, or an armoured or semi-armoured hand, you could use a hand in a heavier-looking glove. Something for the seasoned inventor and engineer, while handling dangerous objects. After all, you wouldn't want to catch lightning (and by extension, electricity) with your bare hands, now would you ? We could make up some pseudo-Latin or actual Latin translation of the IG's motto. Did any of the few official TDM missions use Latin in any way ? According to http://wiki.thedarkm...#Misconceptions there's at least one electrical guild: something to bear in mind when deciding how much prominence to give to electricity. 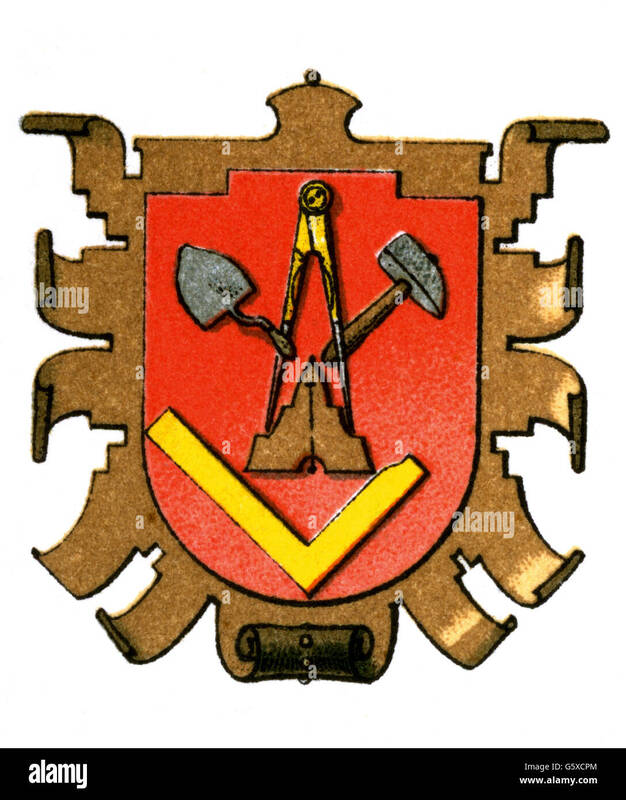 I looked at the coat of arms for both medieval/early modern guilds and present-day mechanical engineering organizations for inspiration. Any further suggestions? I did another and I cant find it now but it was 3 interlinked gears of varying sizes on the shield with crossed lightning bolts behind it and an open book under. Is there a IG motto? I know Latin and I used the Creatio per Scientias (creation through knowledge) on the logos I created, but I was thinking thatd just be a logo for the lodge/college/whatever I have in my map, which is in a district of Bridgeport called Northgate that I created for the series Im working on. Edit: wrt Latin the wiki states old and official texts should use Latin where appropriate. Edited by dmw88, 05 March 2019 - 09:12 PM. I used there as inspiration. I think these look all too generic. 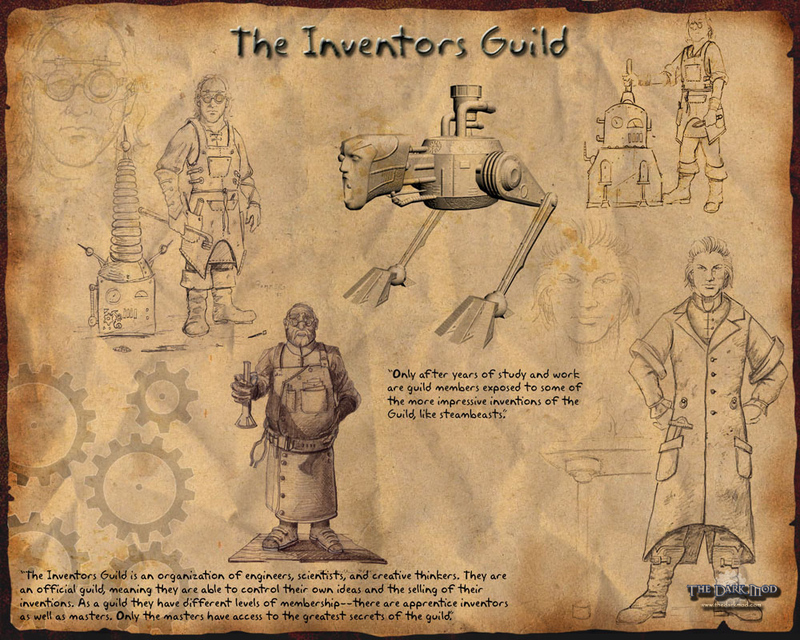 If there is an electric guild managing the generators we see all around, what is the main product of the inventors guild? The robots maybe? Then they should go into the logo so people recognize it's both an inventors guild and TDM! What about a blueprint or a parchment or something in the center? Because you have the gear in the background, and the hammer and spanner too which represent the guild so a blueprint/design sort of logo in the middle might cover the creation aspect of the guilds ethos. Either that or something like a moon crest or wolf or something just so its not blank in the middle. I think the rest of the design looks great around that. Its just nailing that center bit. Exactly my thoughts - the middle is whats lacking. I really like the idea of a blueprint. Im gonna sketch this up now.